“What’s the easiest way down?” asked a day hiker on his way up with a friend towards Lions Head. “You’re on it,” was my reply, “and I would go any further the way you are dressed.” His friend was in red Under Armor tennis shoes. They quickly agreed and then volunteered that they’d never been so scared in their lives. But that is jumping ahead. We’ll get back to them in a moment. 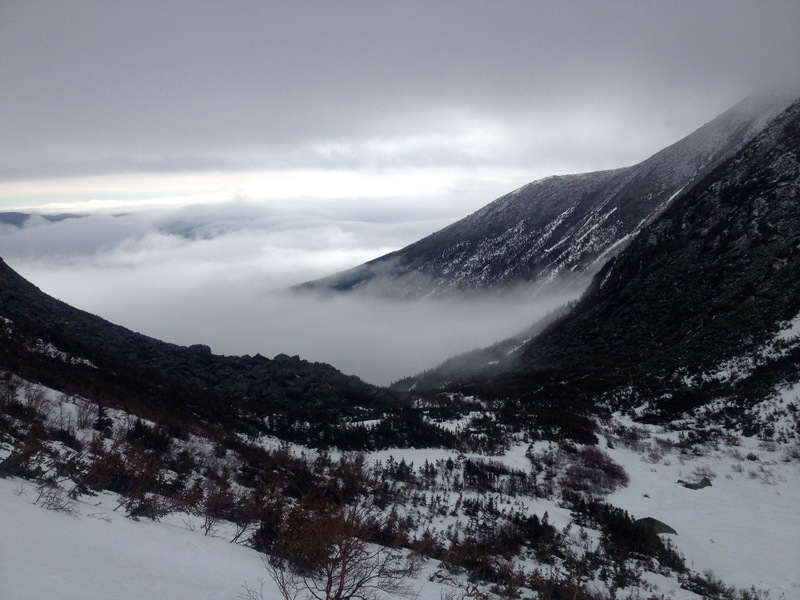 Greg Gorecki and I left Ohio at 5am on Friday, morning heading towards New Hampshire and the Pinkham Notch Visitor Center/Tuckerman Ravine trail head. Our plan was to hike up to the Hermit Lake lean-tos Friday evening, summit Mt. Washington and return to the lean-to Saturday night and hike out for the drive home on Sunday. 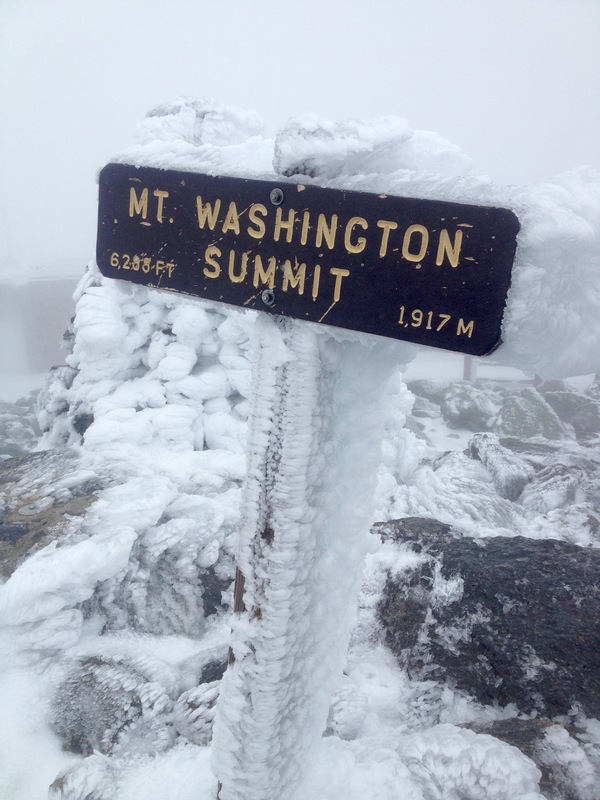 Lots to accomplish on a mountain that is known for its unforgiving weather. Our forecast had jumped around from a chance of 10-12” of snow to clear sunny skies; temperatures were consistently calling for 20s-30s. 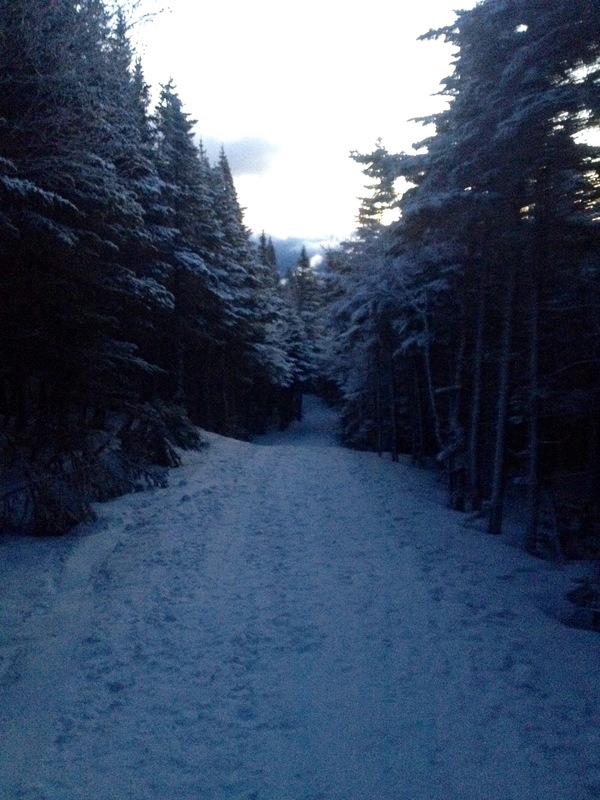 We were disheartened to arrive in Gorham, NH at the base of Mt. Washington to find a steady rain. We kept a lookout for a local burger joint to shelter in and wait out the rain, but none was found, so we continued on to the trailhead. At the Pinkham Notch Visitors Center we signed the rangers log with our itinerary (family at home also had a copy of our written itinerary) and paid for our two nights stay in the lean-tos. Raingear was added over our shorts and t-shirts because of the rain. 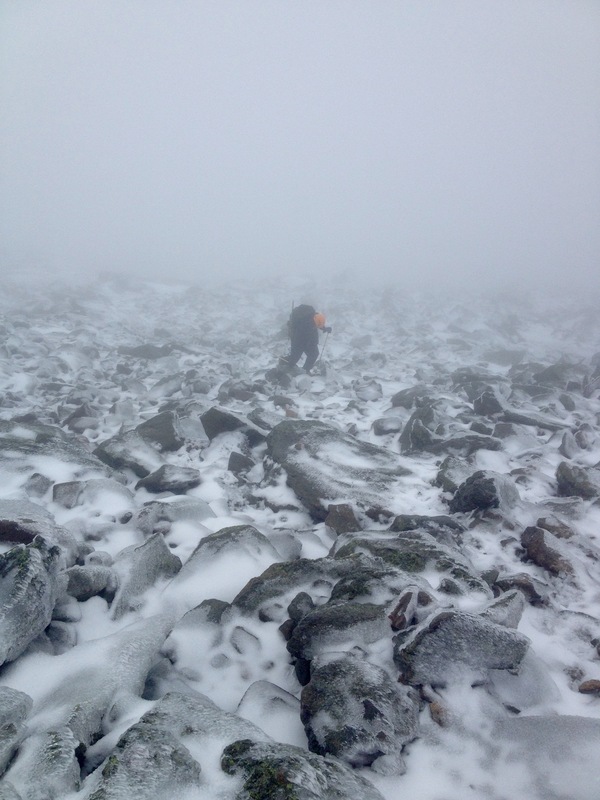 We knew we wouldn’t need much warm clothing for the 2.4-mile (2,000ft. of elevation) hike up to camp, we’d be generating plenty of heat. The hike up was smooth and it was nice to quickly climb above the rain and lose our jackets. Sleet and wind increased as we approached the final 0.5 miles, but not enough to warrant dawning our jackets again. Soon we were seeing headlamps of others in the camp area of Hermit Lake. The first lean-to we checked out was occupied so we kept going and made our way to lean-to #3 which is the same one Joe Campbell and I stayed in two years prior. Now that we’d stopped moving we quickly put on our down jackets before spreading gear for the night and cooking dinner. Temperatures overnight never dipped below 25 degrees, making for pleasant sleeping conditions. We slept in and allowed the sunrise to wake us about 7am. 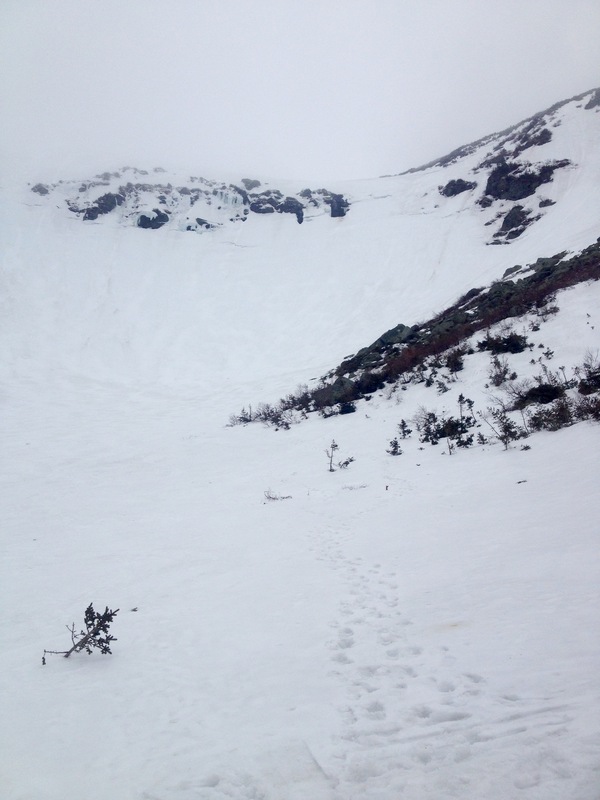 We did an avalanche beacon check before leaving the lean-to and were the first people into the bowl of the ravine that morning. The sun kept trying to poke through, giving us hope for blue skies but it never fully materialized. A positive for the morning was virtually no wind present. 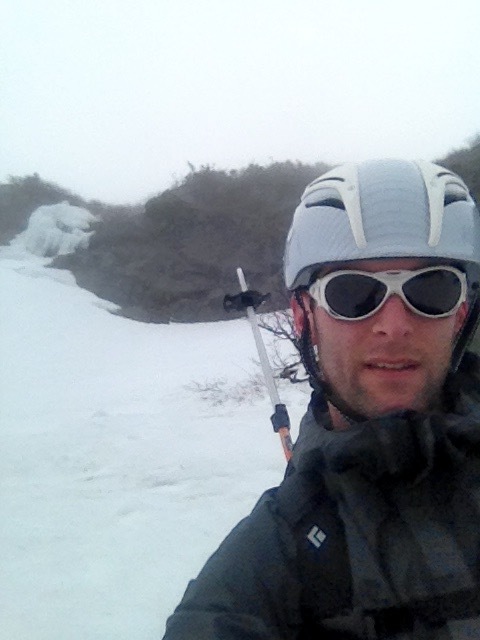 In the bowl we put on our crampons, helmets and took out our ice tools. Looking at our options we decided on a line to the right of Lunch Rocks and the start of Right Gulley, once half way up we traversed left and finished on the steeper slope of Sluice. 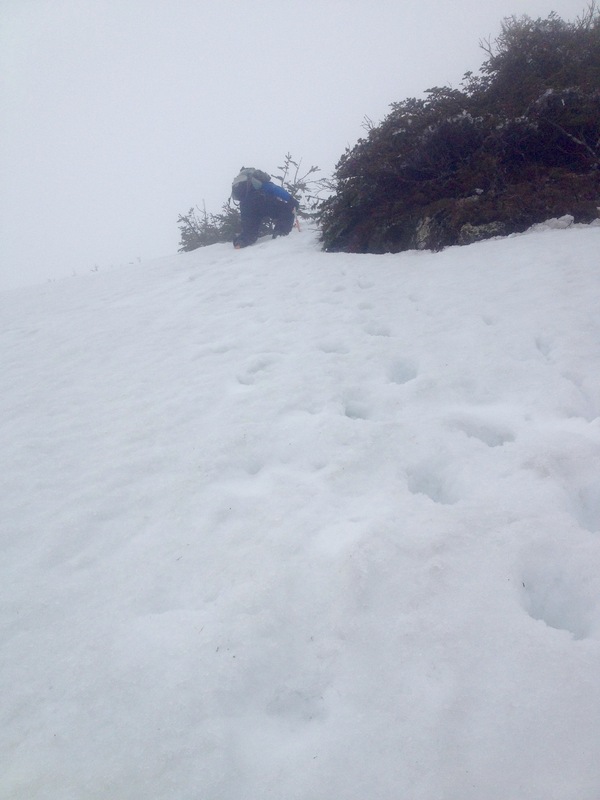 The snow was just right; soft enough to kick steps into without much effort yet firm enough to not avalanche on us. 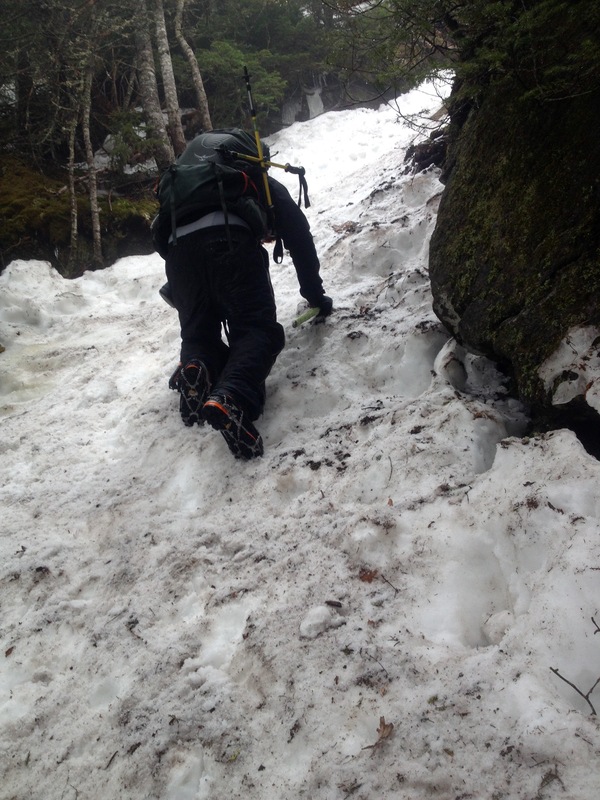 I did find an air-pocket near the end of our traverse, likely caused by water flowing under the snow. I sunk into about my waist and was able to easily remove myself, but warned the other about it. I felt very secure and in my element, stopping to take a few pictures during the ascent. This was my first time going directly up the ravine. Once on low angle terrain we stopped and I pulled out the map to confirm our direction of travel to join the Lion’s Head trail that we would follow to the summit. We were now in full clouds with visibility being only about 50yds. After about 200yds. on the eastern snowfield we reached the trail junction and the final boulder field with cairns that would lead us to the summit. The rocks were covered in ice but you could see the water percolate through due to the warmer temperatures. Crampons remained on because a slip and fall here would certainly mean a bloody knee or possibly worse. This 0.4 mile section always seems to feel longer than it actually is because of the precarious footing. Regardless, after 40 minutes of ascending we were at the summit road, weather observatory and official summit sign. We took a few photos and struck up a conversation with a weather observatory staffer who was walking about. We all commented about how calm the summit was today, clouded in with no views, but very little wind at this time, maybe 15 mph. Soon we were on our way back down the trail. 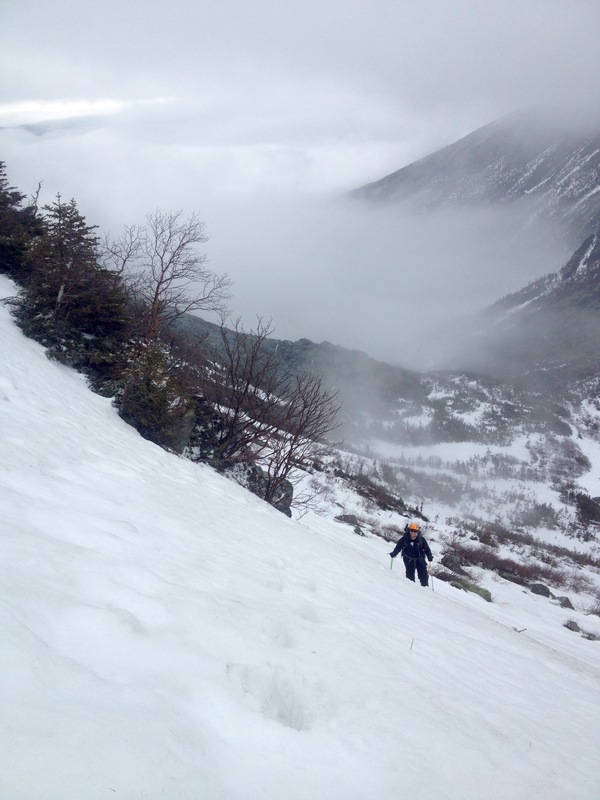 Our plan was to follow the Lions Head trail back to Hermit Lake avoiding the steep ravine and skiers there. After the boulder field there was the open eastern snowfield that made for a fun glissade, so much so that I climbed back up for a second go at it. Crampons were now off as we made our way to the Lions Head and we took a moment to overlook the ravine and valley with some improved visibility. Shortly after leaving Lions Head we encountered two day-hikers from Boston, Brandon and Connor, on their way up. They quickly asked what the easiest way down was and I replied that they were on it. Connor stated, “he’d never been so scared in his life.” They asked about going around the ravine and down the other side. Looking at Brandon’s red Under Armor tennis shoes I said that would be ill advised and that they shouldn’t go any further, which they agreed with. 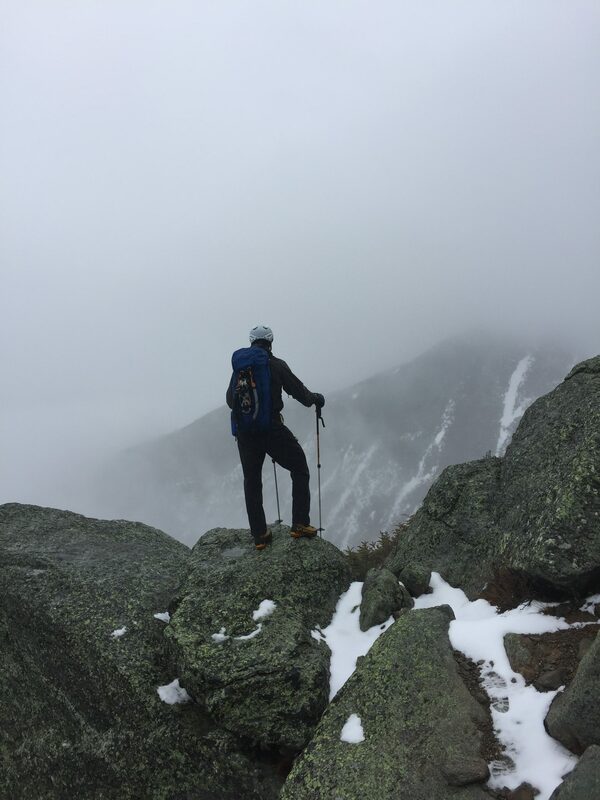 Greg and I continued down in disbelief with how they made it this far and soon reentered the snow covered ground and trees of the Lions Head summer route. 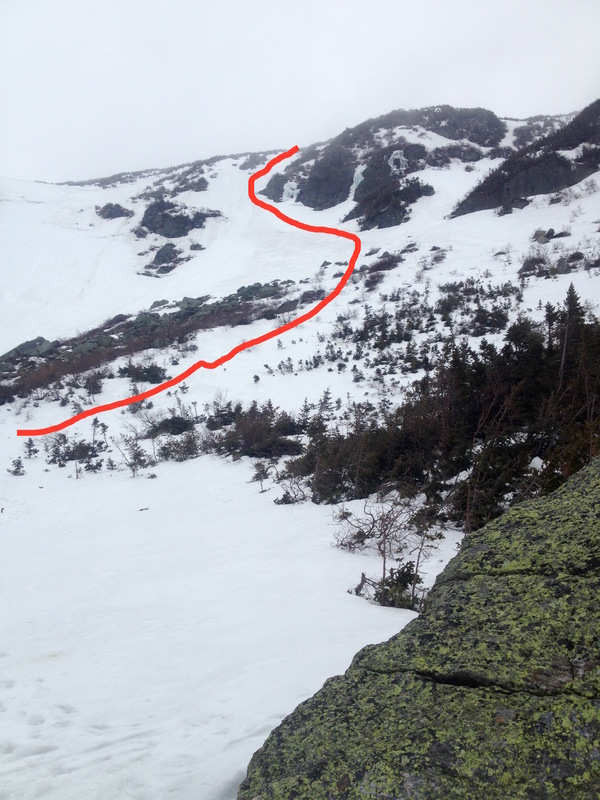 We glissaded another short section and I started again on a second but narrower section where I quickly gained speed and rolled to self-arrest before hitting trees. Safely stopped I yelled back up to Greg to not glissade this section, it wasn’t worth the risk. At this same time, the two from Boston were glissading down and Greg had to grab Connor before he slid hard into the trees. A conversation between Greg and them ensued while I waited below. Recognizing the terrain and their lack of proper gear I started to come up with a plan. I first put my crampons back on and took the second ice tool off my pack. I ascended up to the group and handed each Brandon and Connor an ice axe, I would be fine with just my crampons based on the steepness. We slowly descended the next 50yds., with Brandon and Connor each slipping and dangling from the ice axes a couple of times each. Brandon also brought out his K-Bar knife to stab in the snow/ice for stability as well. Soon another climber caught up with us who also had two ice tools, so he gave one to Brandon that allowed me to now have my ice tool back. We continued this way for another 50yds. before we started to literally chop steps in the snow so Brandon and Connor would have better footing. This continued for the duration of the 0.5 mile stretch of trail we were on before rejoining the less steep Tuckerman Ravine trail. 3 hours to travel 0.5 miles. Eventually we made it down and everyone went their separate ways, Connor and Brandon to the parking lot while Greg and I went back up the lean-to. We kept laughing in amazement about how far up they got and how lucky they were no one got hurt. Connor had called Brandon that morning and asked him on a hike so he thought great, I’ll wear comfortable shoes. They had looked at the weather forecast that said low-mid 30s with a chance of 1-3” of snow. They failed to account for the total accumulation of snow throughout the winter. We’ll all be talking about this one for a while. Before getting to the lean-to we stopped at a water pump that is near the Hermit Lake caretaker’s cabin. Water bottles filled and back in the lean-to I fired up the stove to boil water for our evening meals. Knowing we were going to have an early 4:30am alarm Sunday morning to begin our hike out, we crashed out well before dark at 7pm. Before getting into deep sleep a large group of Canadians, 40 of them, came into camp and we made room for 10-12 of them in our lean-to. After adjusting, we were quickly back to sleep. 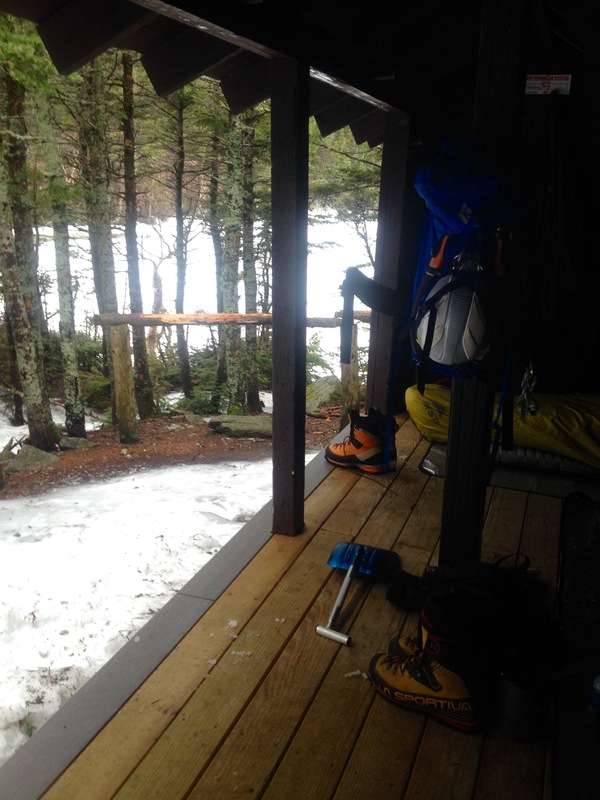 Overnight, the winds had increased and we awoke at 4:30am to a light dusting of snow covering our gear and us. 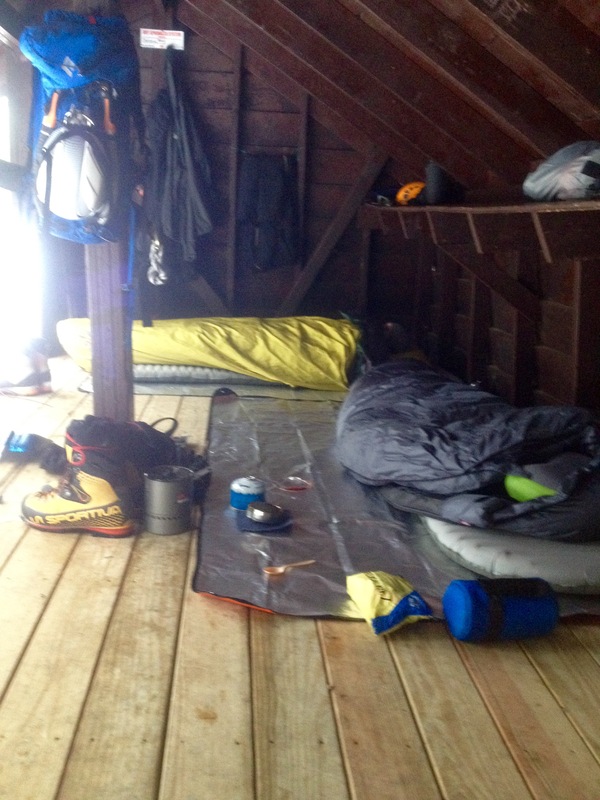 No bother, we were quickly packed up before sunrise and started out under headlamp. The sun began to appear over the horizon giving some great views. An hour and fifteen minutes later we were back to the visitors center and a hot shower. We were on the road back to Ohio by 7am with another set of experiences to carry us on our way.